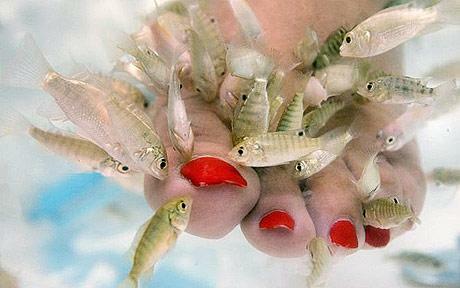 Fish pedicures have caused quite a stir in the USA. This pedicure includes immersing your feet and legs into a tub with tiny dead flesh eating fishes! There is a type of carp (no, they are not Piranhas or do they have teeth.) called Gara Rufu fish or Dr Fish. They originated and still live and breed in the pools of some Turkish river systems and hot springs. They are used as a treatment that has been shown to alleviate the symptoms of psoriasis. The treatment is not curative, and no cure for psoriasis currently exists. Some even say that it is a combination of the sulfuric hot springs, the fish and the sun in the area in Turkey that combines to help alleviate the pain/symptoms of psoriasis. This practice is widely accepted in Asian countries, and Turkish countries have baths that you completely immerse yourself in (Yikes!). I have attached a link to a video showing a hot spring widely used by folks with skin disorders in Turkey. I will warn you that if you are squeamish or even ticklish, you might not want to watch. I think it is great story and it is so nice that folks get some relief! Now here in the United States it is banned in 14 states. Why? Health concerns. 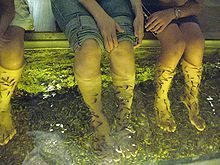 Here in Nevada, the Cosmetology Board has refused to license fish pedicures. Citing sanitization and disinfection regulations. How do you sanitize a fish? You can’t bake them at 220 degrees and still get any use out of them. And other states agree. These other states also aren’t convinced that having the dead skin of one’s feet pecked off by tiny, hungry fish is a sanitary procedure. Fourteen states, including Texas, Virginia, Delaware and Florida, have placed bans on so-called fish pedicures. And, it is widely acknowledge that if you have Diabetes and or a weakendc immune system, Fish Pedicures are NOT for you. Personally, I get kinda squiggly when I see the videos. Even though some of them show people laughing their heads off because it is so ticklish. I suppose if I had the chance to try it, I may. Maybe after a big glass of wine!!! No, I can’t honestly say that I would. Maybe because I don’t like anything slimy anyways!!!! But how can all those folks in the Eastern countries be wrong. And this has been going on for a long time! I thought that a interest blog post subject to share with people when I travel to other places checking out different salons. 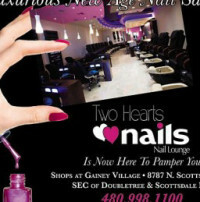 I got the chance to see two different salons while in Scottsdale recently. Let me show you one today. It is relatively new in Scottsdale. Maybe just over a year old. 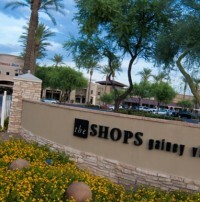 It is located in a very nice mall off of Scottsdale Road called The Shops at Gainey Village. The interior was very clean, modern and bright. They had a half a dozen nail tech tables at the front of the salon, two lines of pedicure basins, and the part I thought was brilliant was the bar. Yes, a bar. You can gather your friends and get manicures while having a glass of wine, champagne, coffee or tea. Complimentary of course. 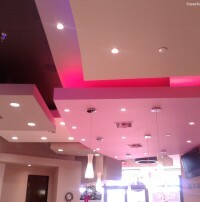 The above picture is to show you the lighting in the salon. Pinks and pretty purples soften it all so nicely. I asked if I could snoop around a bit and they staff gladly showed me the facilities. 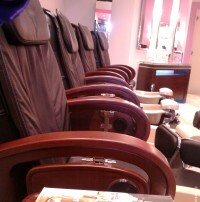 Including the back room (which as we all know can tell the truth about the salons cleanliness). I was happy to see two autoclaves, a industrial size washer and drier and a full sized sink. The bathroom as well as the private waxing area were all very clean and tidy. I indulged myself with a spa pedicure. 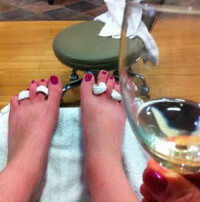 They took me to a pedi station and sat me down, gave me a magazine and a glass of wine!!! How wonderful! A mini hot stone massage before a scrub was applied and worked in. Next a paraffin dip. They did this by placing the paraffin in plastic bags and placing my feet in the bag. I like that idea. No chance of cross contamination of any kind that way. Hot towels were then placed on my legs. A good cleaning and another little massage and on to the polish. Oh yes, the polish. This salon had a crazy amount of polishes to choose from. 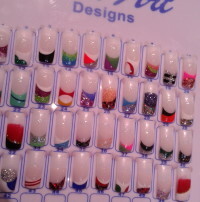 Plus, they had gel colors to match each color, and a variety of different brands. While I was relaxing with my paraffin treatment, I got shown some different free edge designs available to customers for acrylic nail enhancements. 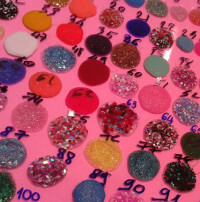 As well as the different types of glittery gels available. I enjoyed the experience. 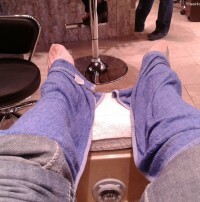 It is very different from when I did pedicures in my salon, where it is a little more private but none the less. Who doesn’t like getting massaged while having a cold glass of wine anyways????? 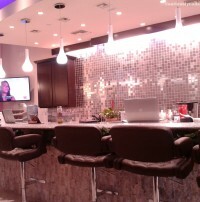 New age of Nail Salons has arrived. Your enjoying your afternoon away from the house….had a manicure and pedicure with your favorite nail tech, lunch with your girlfriend and a nice stroll through the park. 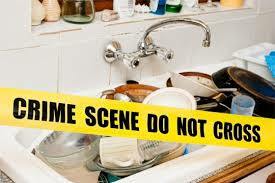 Then you get home and the families lunch dishes are in the sink!!!!! Yikes!!!!! 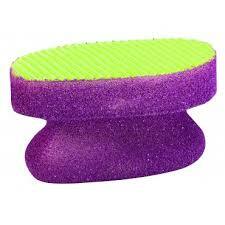 The Hands Away Scrubber is a brilliant idea for us gals that love to keep our digits in perfect condition! The special sunken grip lets you hang on to the scrubber without damaging your pretty nails! LOVE it! The second one, the Super Sponge & Squeege will help you refrain from digging into the corner of the casserole dish with your nails to get out the baked on sauce. Thank you Casabella for your fingernail friendly kitchen gadgets! I think Oprah feels the same way!